​ ​EDINBURG – WalletHub has named Edinburg 2nd Best Small City for Soccer Fans for 2017. In addition, Edinburg ranked 29th best among all U.S. cities for soccer fans, an accomplishment that places it in the top 10 percent in the nation for community involvement. 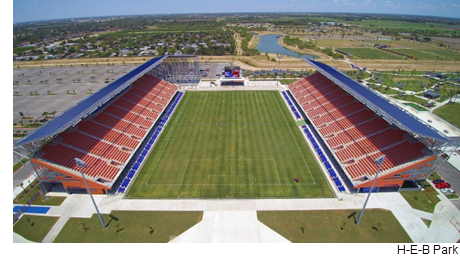 Edinburg’s H-E-B Park—a $16.8 million ​​​sports and entertainment complex and 9,700 seat soccer stadium—is home to the Rio Grande Valley Football Club Toros, a member of the United Soccer League (USL). ​​The RGV FC Toros serve as the development affiliate of Major League Soccer’s Houston Dynamo. ​Check ou​t more public facilities stories across Texas.